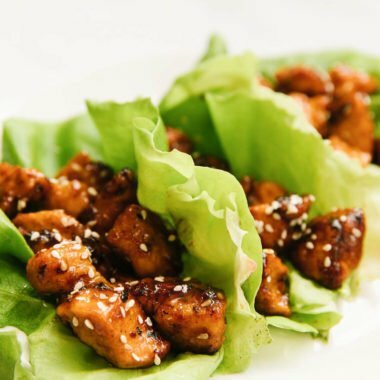 These Sesame Chicken Lettuce Wraps are to die for. Okay, I know what you’re thinking. I swoon a lot over food, as food is my love language. 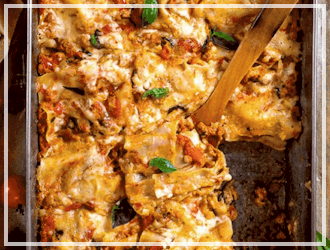 But this recipe…THIS recipe is truly perfect in every way. 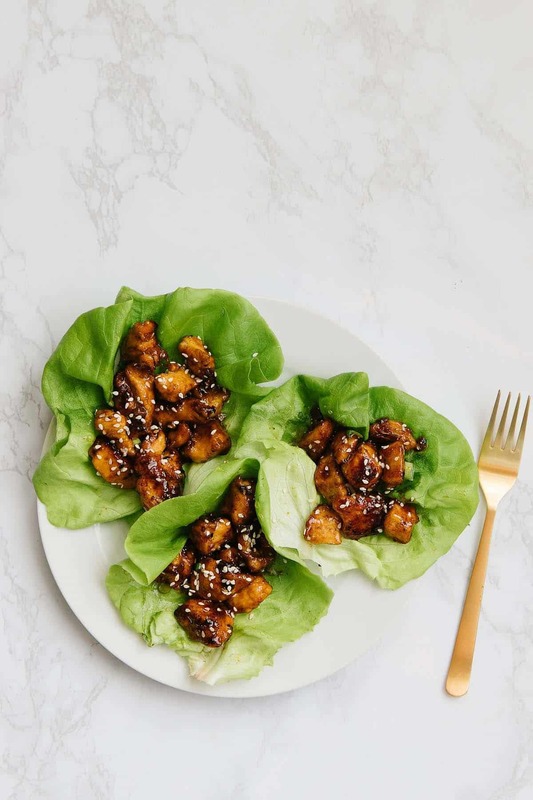 Just the right amount of sweet gloriously tied with the light flavor of sesame, cooked hot and fresh in a skillet, then tucked into little lettuce cups. Oh mannnnnn…. Sooooo good! You will love it, I promise. It’s easy, isn’t it, to feel like you’re not enough? This time of year, especially, it’s so easy to get a little overwhelmed. I mean, honestly, I can only handle trying to change one habit in my life at a time! All my friends are doing these big challenges, healthy workouts, budget boot camps and spring-cleaning or organizing plans. And then there is me. Just watching everyone do their stuff. Ha! Hey, it’s okay to just be good at cheering others on, right? Right? Everyone needs a fan to cheer them on. It’s an important job. I may not be good at starting or keeping resolutions, even when I really, really need to (ahem)… but I did do something that will help! 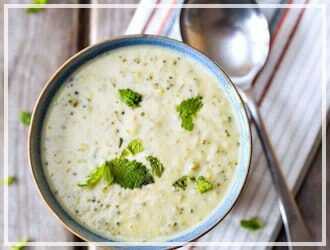 I’ve created some HEALTHY make ahead recipes! 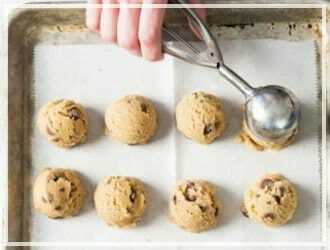 They’ve all been kid-tested, mom-tested and they are easy to make. And seriously delicious, of course! You are gonna love love love these recipes I share with you all month long. Therefore, make sure you are subscribed to my weekly email group to get notified of the new ones! 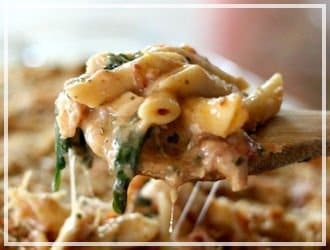 So, friends, I’m starting off January with one of my absolute favorite freezer meals. 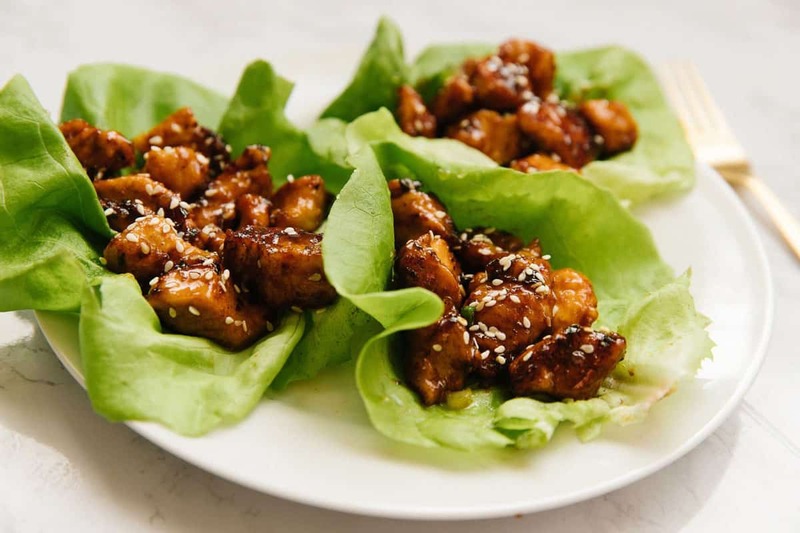 Sesame Chicken Lettuce Wraps. This lettuce wrap recipe is beloved by all my family. And beloved by me because it’s so darn easy to make. 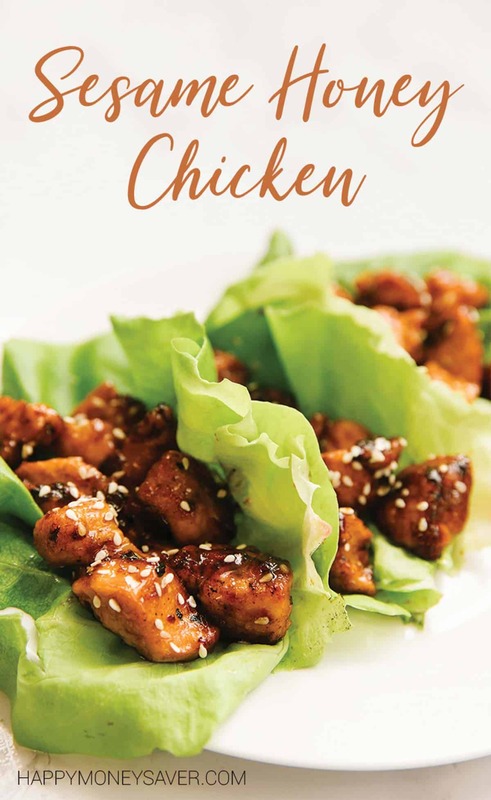 HOW DO YOU MAKE SESAME CHICKEN LETTUCE WRAPS? To prep this dish, all you need to do is chop up some chicken, toss in cornstarch and bag up. Make a big bowl of sauce and divide it up in packages and bam. Done. So easy. You can even find pre-cut chicken at most grocery stores to save on some prep time. 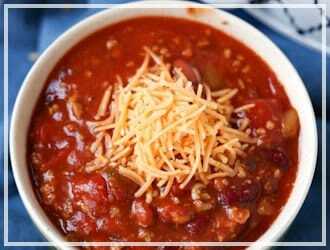 It is easy-peasy and makes such a yummy dinner. 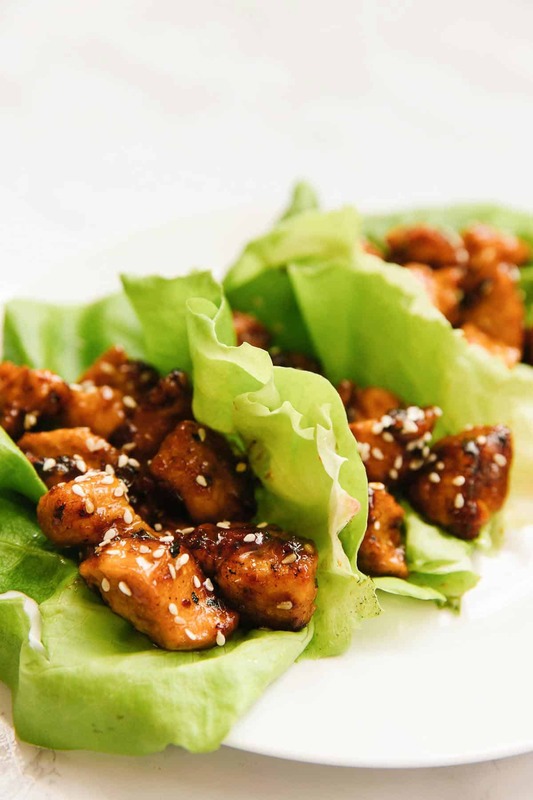 All you need the day you are serving these chicken lettuce wraps are some fresh greens. 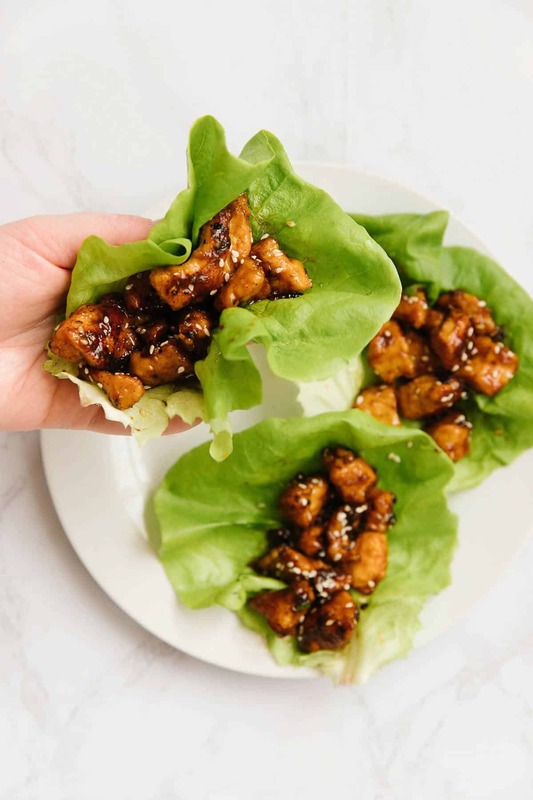 I love using butter lettuce to make these cute lettuce cups! Wrap the chicken up and you’ve got a family favorite meal on the table with hardly any effort. 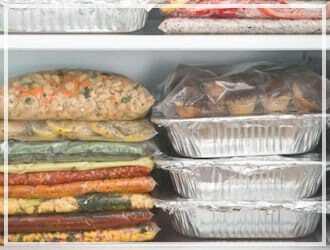 If you like this recipe you might also adore these other 15 easy freezer meals, too! 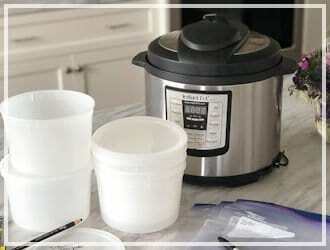 Add sliced chicken and cornstarch into a gallon-sized freezer bag. 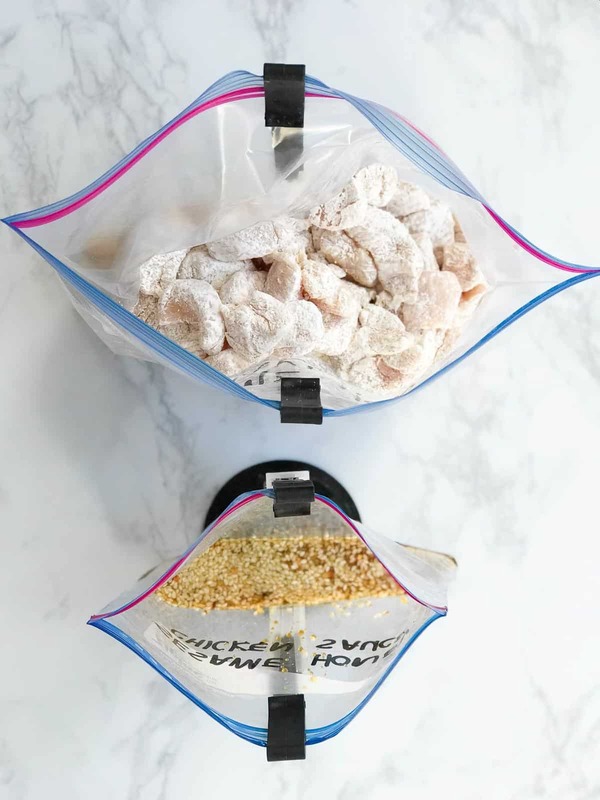 Shake bag until all sides of chicken pieces are coated. Seal bag, removing air. 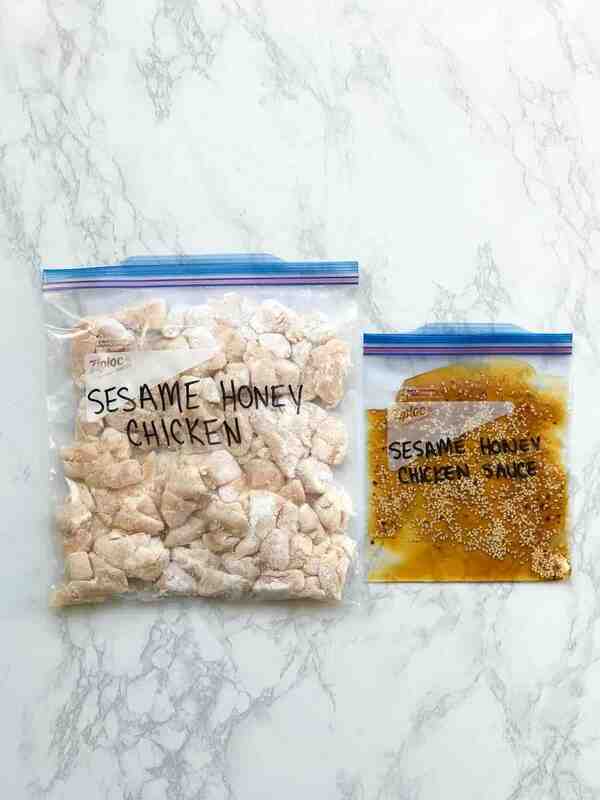 In a small bowl (or place directly into a quart sized freezer bag) combine honey, tamari or soy sauce, minced garlic, sesame seeds, and red pepper flakes. Add 3 Tbsp vegatable or canola oil to a wok or large skillet and heat on high. Add chicken into wok and stir-fry, separating pieces and stirring constantly until the majority of the pieces have gone golden or crispy around the edges on them, about 4 minutes. Add sauce, and cook, stirring constantly for about 1-2 minutes until sauce is boiling and slightly thickens. Serve in lettuce cups and top with additional toppings if desired. Thaw chicken and sauce packets quickly by running warm water until you can break the packets up. 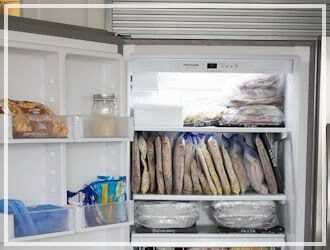 Or place the whole kit in the fridge first thing in the morning so the meat will be thawed by dinner time. Add 3-4 Tbsp vegetable or canola oil over high heat. Add chicken into wok and stir-fry, separating pieces and stirring constantly until the majority of the pieces have some golden or crispy edges on them, about 4 minutes. Add sauce, and cook, stirring constantly for about 1-2 minutes until sauce is boiling and slightly thickens. Serve in lettuce cups and top with additional toppings if desired.